A popular new trend in home heating, in-floor radiant heating has many people wondering if they should stick with their current heating system or switch to radiant heating. Heated flooring can feel cozy and luxurious, but it may be costly to install depending on the type of in-floor radiant heating system you choose. Knowing the pros and cons of in-floor radiant heating will help you decide if this system is ideal for your home or commercial property. What Is In-Floor Radiant Heating? A radiant heating system can provide heat directly to the floor of your home or commercial property. These types of systems rely on heat transfer properties to heat spaces by infrared radiation. The three types of radiant floor heating are radiant air floors, radiant electric floors, and hydronic radiant floors. Your HVAC service provider can help you decide on the best option for your setting. Heated flooring has grown in popularity mostly because of the quality and consistency of the temperature control it provides. Unlike traditional radiators that can leave spots of a room feeling chilly, radiant floor heating provides all-over warmth. Once installed, in-floor radiant requires virtually no maintenance, which is one reason why it's increasing in popularity. Most radiant heating systems are renowned for their energy savings, too. In-floor radiant heat is regarded as safe and can be used with just about any floor covering, including carpeting, wood, laminate, vinyl, stone, and tile. Are There Drawbacks to In-Floor Radiant Heating? There are DIY products available for in-floor radiant heating installation, but many people opt for professional installation either at the time of building or as part of a heating system renovation project. Installation can be costly, but this drawback should be weighed against the low maintenance that system is associated with. Installation may also take longer than property owners could wish, but again, a professional job ensures excellent results. Finally, some existing floors may already be high, but radiant heating will increase the floor height still further. This could prove problematic for appliances in some cases. 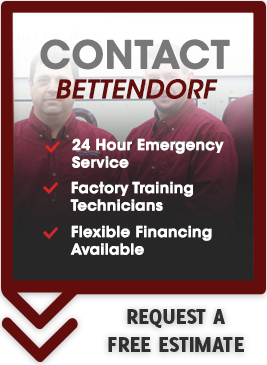 If you're still on the fence about whether to install heated flooring in your home, contact the experts at Bettendorf Heating & Air Conditioning. They can answer all of your questions and address any concerns you might have about this type of heating system and its installation.